Pattaya city is the most exciting tourist beach city in Thailand. Pattaya is the top 3 tourist cities in Thailand and welcome over 7 millions visitors in 2008. The city is nestled along with East Coast of Thailand Gulf. Many people come here especially for dental treatments or medical cares. Pattaya offers first class treatments at much lower prices than their home town. So, the city become popular destination for tourism and health-giving atmosphere. Tourists enjoy great experience of holiday and back home with confident and beautiful smile. Pattaya also offers many luxury hotels, beautiful beaches, friendly people, excellent shopping with reasonable prices and a wide variety of nearby tourist attractions. Thailand is the most visiting destination of southeast Asia with over 14 million visitors per year. Thailand offers irresistible culture combination of breathtaking natural beauty, inspiring temples, outstanding hospitality and superb cuisine. Thailand is the most popular destination in the Southeast Asia. What brings back visitors every years is undoubtedly the warmth of the Thai people, their laidback attitude, the kingdom's at-times incomprehensible yet beguiling customs, feverish festivals, and amazing culinary adventures. Sunny beach, shopping bargains, ancient palaces, and stunning temples. Thailand can offer anyone from the top-executive searching for luxurious respite to the backpackers hoping to explore beyond the beaten track. For many, Thailand's most notable draws are its opulent royal palaces, ancient ruins, and ornate temples housing skillfully crafted figures of Buddha, a revered symbol that underscores a fervent and widespread devotion by the (less Westernized) traditionalists. In madcap Bangkok, you'll find an ultramodern cityscape muscling in on quiet canal and riverside communities. The New shopping complex in Pattaya and the largest beachfront shopping complexes in Southeast Asia. A complete range of shopping outlets, coffee bars, restaurants, chain stores and independent stores. Offering everything from fast food to fine dinning, family entertainment, beauty treatments, shops and banks. Dentist @ Beach is located on 4th Floor here. 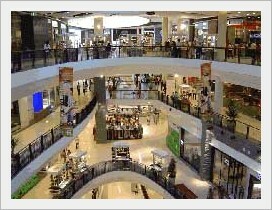 The beach road indoor shopping mall offers tons of shops and brand names. It also provides entertainment attractions like "Ripley's Believe It or Not!" museum and also lots for foods and restaurants on 3rd floor "Food Wave" a large international food court, which offer Thai, Japanese , Russian, Chinese, Italian and European. Walking though streets and bargaining endlessly seem like a good cardio activity and this is a common sight in the busy shopping areas. Soi Boukwang market is on South Pattaya Road oppositing TukCom. There are all sorts of merchandise from clothes to leather goods to chinaware and ceramics to souvenir items to books to thousands of trinkets. Fresh produce of fruits and vegetables and sea bounties also take its righteous place in the streets of the bustling city. 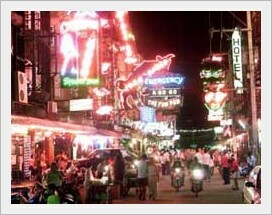 Walking Street is the most famous nightlife area of Pattaya where you find dozens of go-go's, discos, massage parlours and bar-beers compete with each other for your immediate attention. Moreover, there are some many great pubs in Pattaya like Kilkenny's Irish Pub, Hopf Brew House -a three storey pub with atrium, live music and euro-beer. Try Shenanigans for live music every night and a weekend carvery and Hard Rock Café. 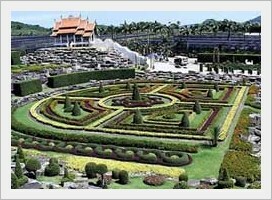 The garden is one of the largest and most beautiful gardens in southeast Asia. They offer elephant show, cultural show and many other events. Even better, we're just a short drive from the center of Pattaya. Nong Nooch also has a man-made waterfall that perfectly complements the natural surroundings, while the Nong Nooch Lake serves as the feeding ground of birds and fish indigenous to this part of Thailand. Experience the tranquility of it all by paddling a canoe along its silent waters. Offer many outdoor activities including tower jumper, rollercoaster etc Let's your child play around large outdoor swimming pool. It offers verities of waterplay such as water slides, splash pads, spraygrounds (water playgrounds), lazy rivers. Component of the park is composed of many rock-like, freestanding structures strewn around. At first, you'd think they were rough-hewn rock, but surprise, surprise, upon closer look, you'll find they are actually petrified trees. The park is also home to a number of exotic animals like parrots, peacocks, an intelligent albino bear, and other albino animals. There are also horses, tigers, cows, and crocodiles, a Malaysian Tapir, a giant 100kg catfish, elephants, tigers, bears, deer, ostriches and literally hundreds of saltwater and freshwater crocodiles. 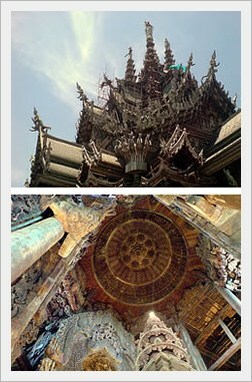 It has numerous wooden structures that represent the seven creators; heaven, Earth, father, mother, moon, sun, and star. Above the four spires of the sanctuary, the four elements that lead to the ideal world according to Eastern philosophy are seen in meticulously carved figures (celestial body holding a lotus flower, celestial body holding a child and leading an elderly person, celestial body holding a book, celestial body with a pigeon perching on his hand). Blessed with a wooded, rolling terrain, this coastal course comprises three nines -"Ocean", "Lake" and "Mountain". The fairways tend to be narrow but the greens are spacious and beautifully framed with bamboo, eucalyptus and the welcome shade of bushes. 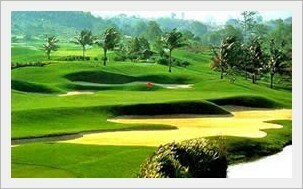 Good clubhouse facilities, and its easy access to Pattaya make this course well worth visiting. This delightful course designed by Ronald Fream and opened in 1993 makes great use of the natural beauty of the surrounding area as well as incorporating both a mango plantation and a huge array of tropical foliage. Look forward to a challenging game, although bunkers are in short supply, great use is made of island greens. 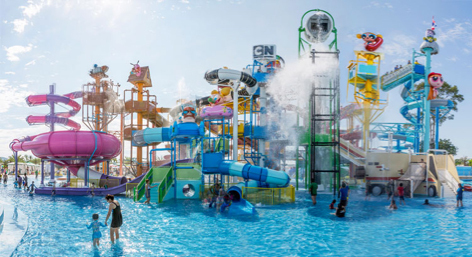 Cartoon Network Amazone Waterpark is the world's first Cartoon Network themed waterpark. This is a great place for kids. One can easily spend 4-5hrs here. 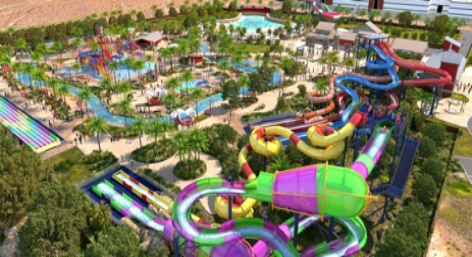 The water park has everything from water slides to lazy river and even a wave pool. They even have a baby section with water slides and a pool for kids below 5yrs. The food court inside the park is good and even has a decent selection for vegetarians to chose from. Ramayana Water Park, Thailand - biggest waterpark in Thailand. The over 16 hectare RamaYana Water Park is located 25 minutes away by car from central Pattaya, near the Khao Chi Chan Buddha mountain. Features include 21 water slides, two dedicated kids’ zones, a wave pool, lazy river, floating market, elephant rides as well as several other activities and relaxation areas, totalling 50 independent attractions. Most visitors go to Pattaya by road from Bangkok, many go directly when they arrive Suvarnabhumi Airport by Motorway. From Bangna, Bangphli, cross the Bang Pakong River to Chonburi and take Chonburi bypass road to meet Sukhumvit Road passing Bang Saen Beach, Bang Phra to Pattaya.